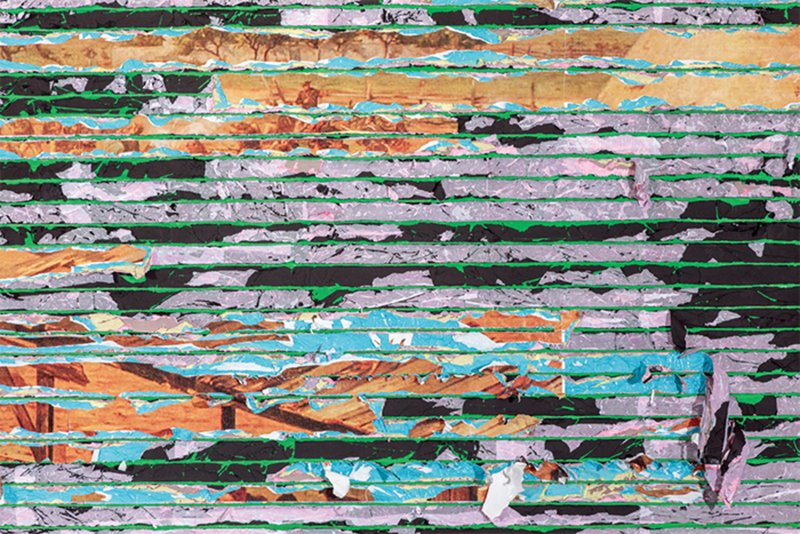 Mark Bradford, Pickett’s Charge (detail), 2017, mixed media on eight canvases, overall 12 × 400'. Bradford’s work revels in the material and metaphoric properties of paper. One sheet can be shredded, but if you layer it and soak it with water, the stuff becomes as durable as rebar: We are indeed stronger together. If paper and printing were once essential to the democratic project, it’s telling that Bradford’s focus has been less on printing than on erasure. The textured, puckered, and scarred contours of his canvases evince a low hum of wounding, a palimpsest of the daily microaggressions endured by those not considered to be straight white dudes by the culture at large. That his mutilated abstract fields are often ravishing speaks volumes about his work’s capacity for complexity. For this exhibition, Bradford presents a four-hundred-foot-long panoramic installation in the iconic circular galleries of the Hirshhorn. Referencing numerous American struggles, from the AIDS epidemic to race riots, and taking the Battle of Gettysburg as its starting point, the piece will surely show us that democracy is also an affair of the heart.